Discussion in 'PS2' started by BitBuiltBot, Dec 21, 2017. 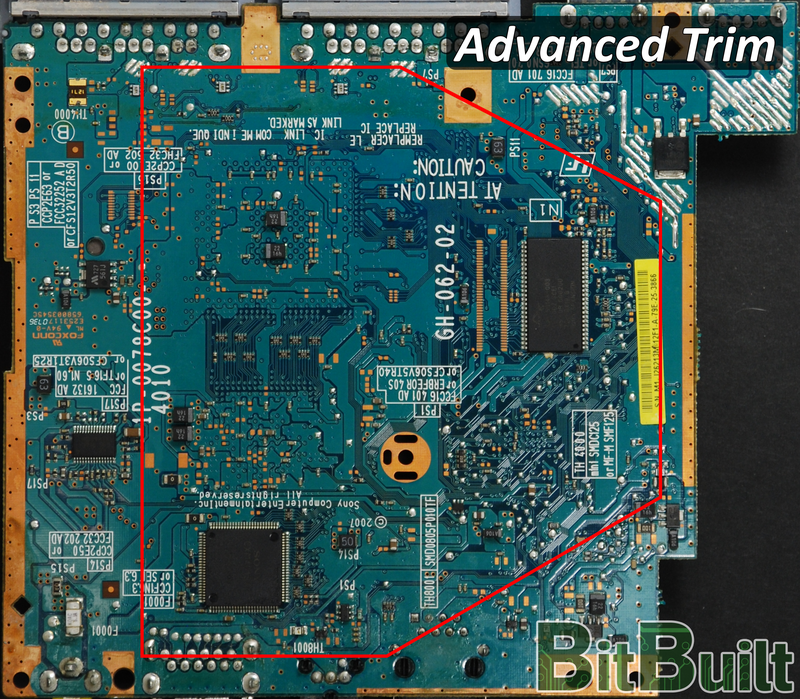 This guide focuses only on the 7900X series motherboard as it is the smallest PS2 motherboard with its integration of the custom ASIC. The guide will feature two trims at different skill levels that both remove essential components for the operation of the disc drive. Therefore, a Free McBoot memory card and a USB drive will be used to load games using Open PS2 Loader. 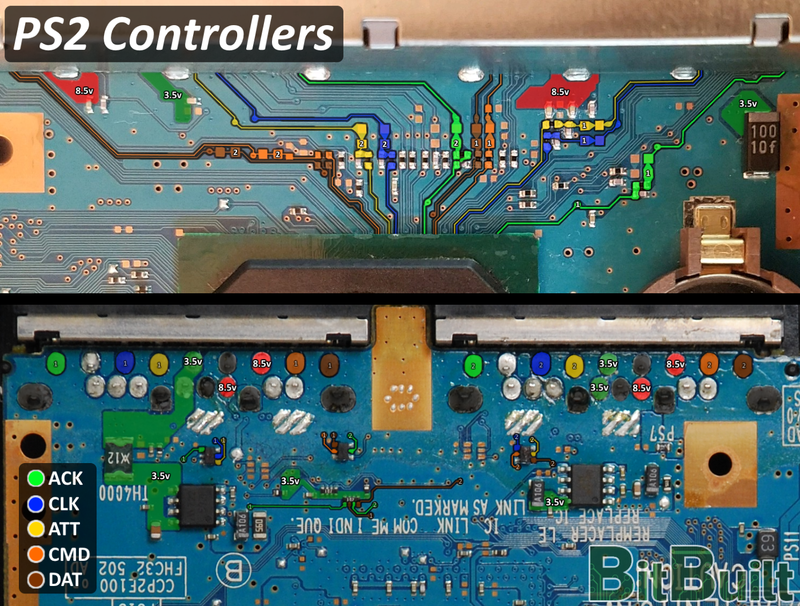 A 7900X series motherboard can be found inside a PS2 Slim model and identified from the label underneath the console enclosure. You should have a clear understanding of this guide before you begin trimming. It is recommended to remove the ethernet port before trimming the motherboard. The large ICs, resistors, capacitors, and connectors that the trimming lines go through are perfectly safe to cut through and remove. It is important to fully remove these components and clean the pads if needed so there are no shorts on the board. The 7900X motherboard is a 4 layered board so it is crucial that you sand the edges of the motherboard with at least 600 grit sandpaper after cutting. In addition, the audio/video, controllers, memory cards, and USB will need to be relocated to alternative points. Dimensions: 11.5cm x 10.7cm. In addition, the audio/video, controllers, memory cards, USB, and CMOS battery will need to be relocated to alternative points. Dimensions: 9.3cm x 10.7cm. 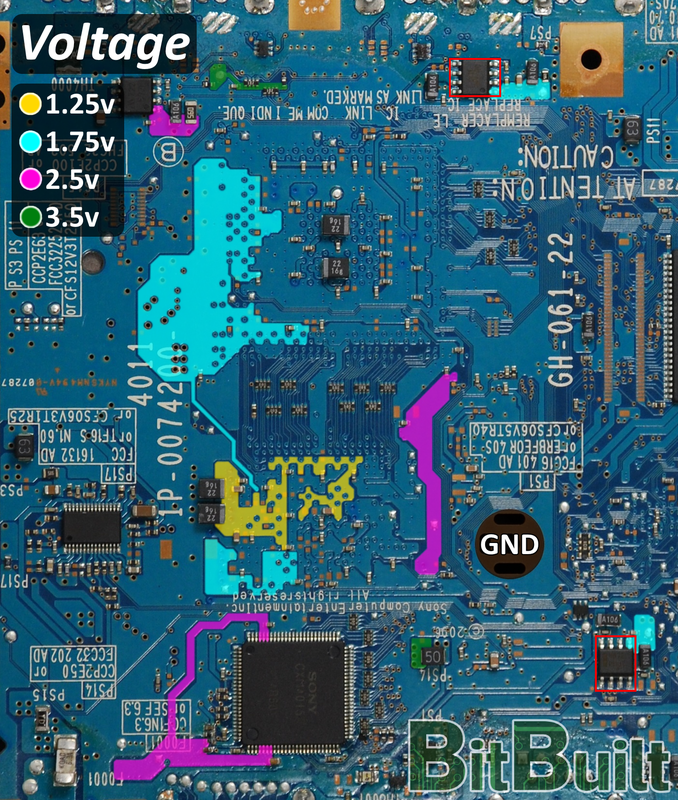 The 1.25v regulator will source 3.1A. Choose a regulator that is capable of providing enough current. 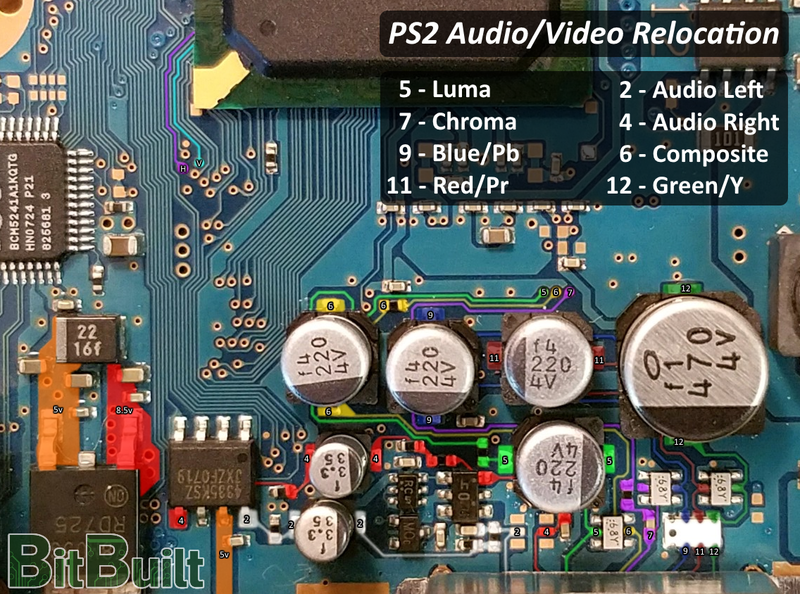 The PS2 may be unstable if the 1.75v regulator is a switching regulator. It is recommended to use a 1.75v linear regulator so there is less noise on the voltage output. The voltage relocation differs slightly between the revisions of the 7900X series. For some of the voltage relocation points, there are no convenient solder pads so you will have to scratch the solder mask off with an x-acto knife and solder directly to the copper plane. 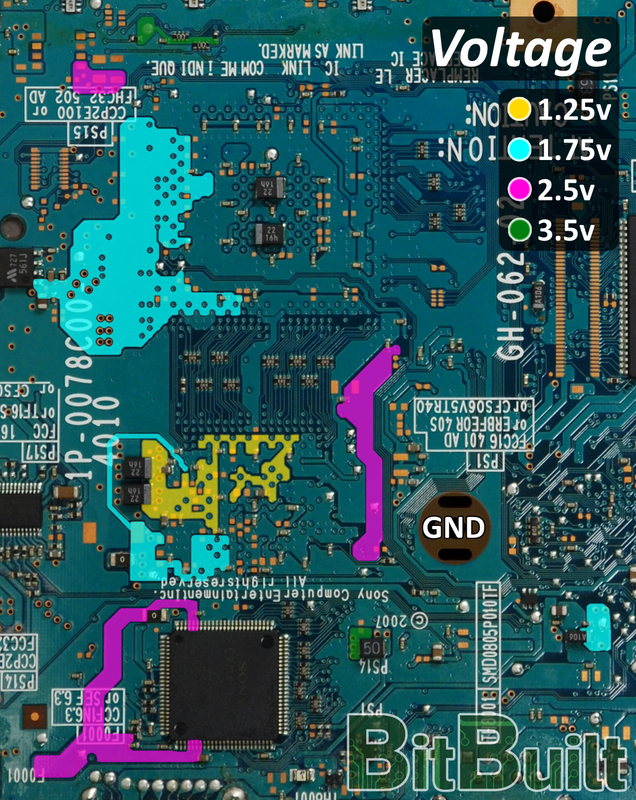 The 1.25v, 1.75v, 2.5v, and 3.5v on-board regulator components need to be removed prior to performing custom regulators. 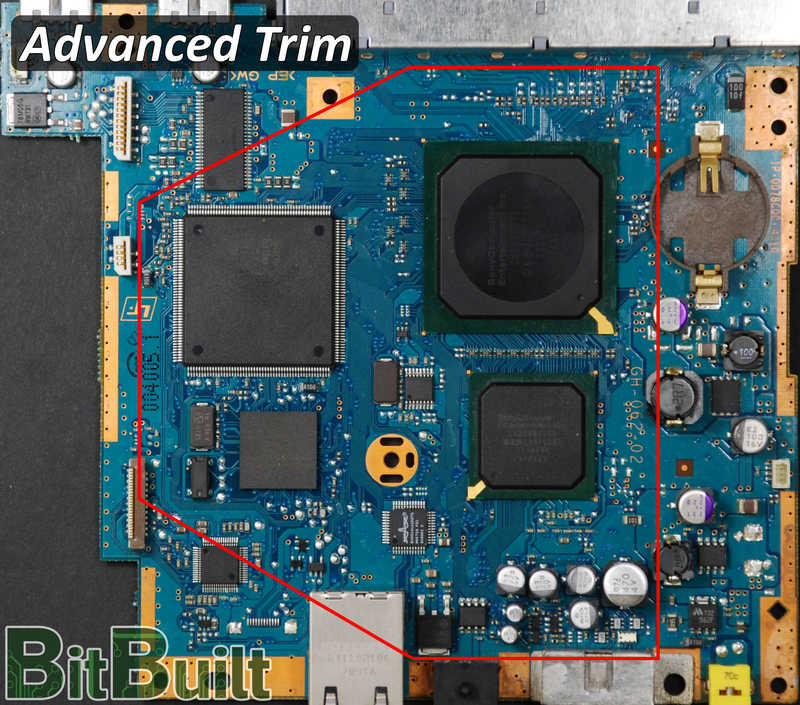 By trimming the motherboard, the majority of the components will already have been removed. However, for a 79001 motherboard, the two 8-pin ICs labeled will need to be removed. The CPU outputs a 1.7v logic level Horizontal and Vertical sync so native VGA can be easily achieved using the sync signals and RGB; no need for a YPbPr-to-VGA converter. However, most PS2 games do not support progressive video so your screen should be compatible with an interlaced signal. 8.5v is only required for controller rumble. A Free McBoot memory card is recommended to be relocated on Slot 2. 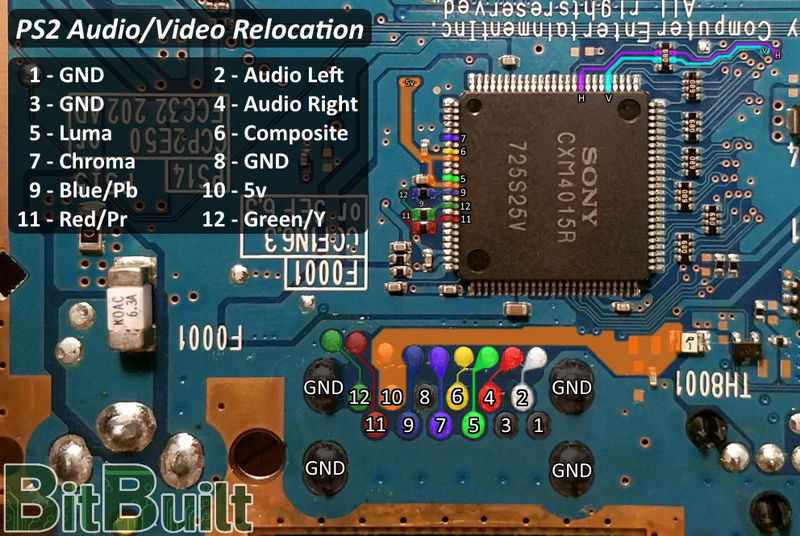 Open PS2 Loader features a Virtual Memory Card compatible with most games so a memory card on Slot 1 is optional. USB is one method for loading homebrew on the PS2. 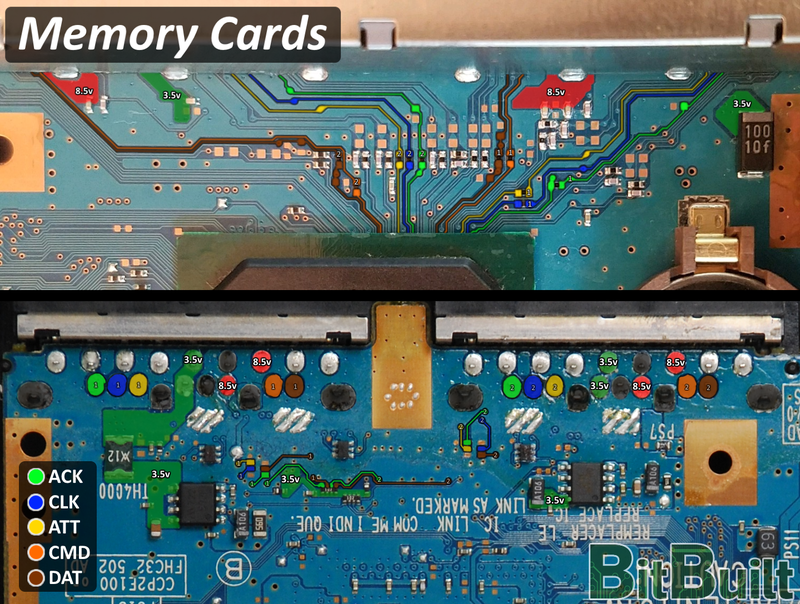 Relocation of the USB data lines will require you to scratch the solder mask off the pcb and solder to the trace. This can be done using 38 AWG magnet wire. 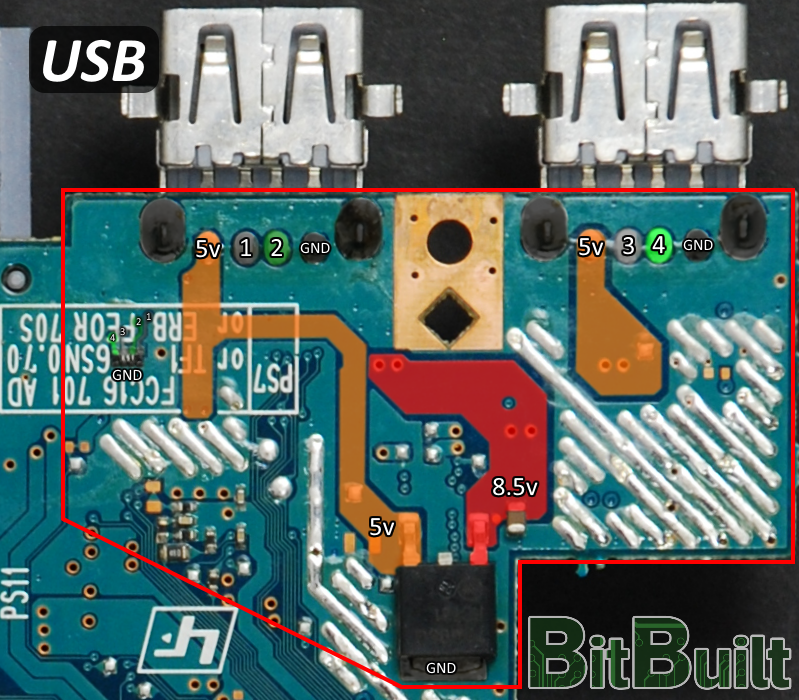 A pull-down resistor (15k ohm resistor) must be connected from each USB data line to ground. It may be beneficial in some circumstances to simply trim the corner of the board off like shown. 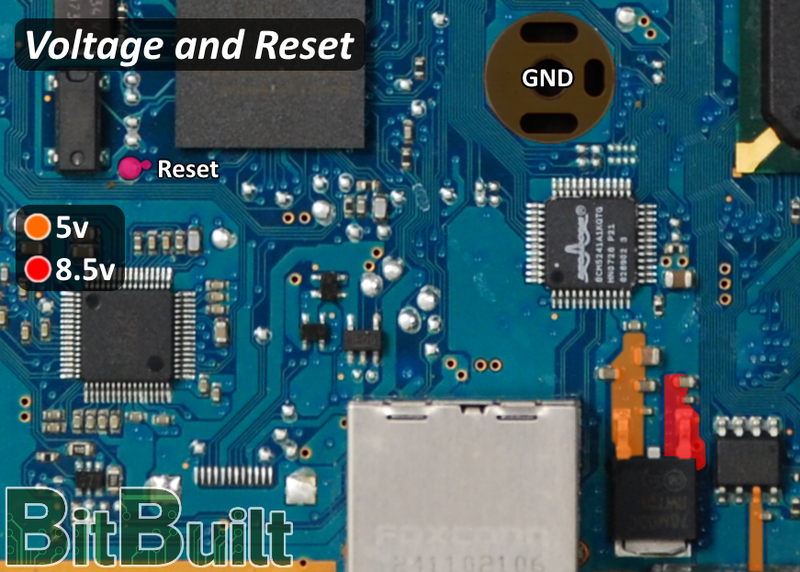 This way you can retain the USB ports, pull-down resistors, and 5v regulators. Don’t forget to sand the edges of this board as well. 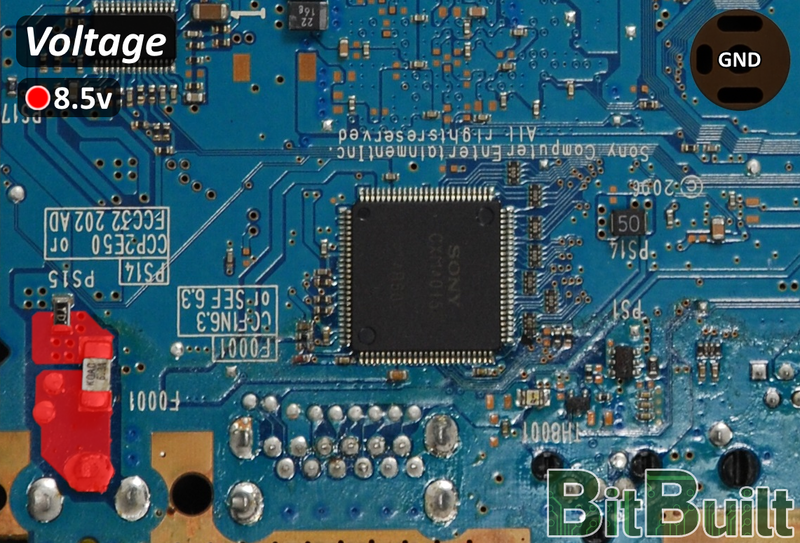 The CR2032 CMOS battery is responsible for saving the time and date settings in the PS2. If this feature is not desired, it is not required to be relocated. Feel free to ask any questions you may have about PS2 trimming and thanks for reading! mknrls, Nse, gamba66 and 20 others like this.